Deep, skin plumping hydration, skin feeding vitamins and defending antioxidants, clarifying, strengthening, clarifying, correcting and brightening intelligent formulations that adapt to the needs of your skin. Forest Dew Plump + Hydrate Beauty Water 50ml, Mask Supreme 7-in-1 (10ml) and vitamin rich Radiant Light Facial Serum Oi 15mll. Leaves your skin with a fresh, glowing with a dewy complexion. 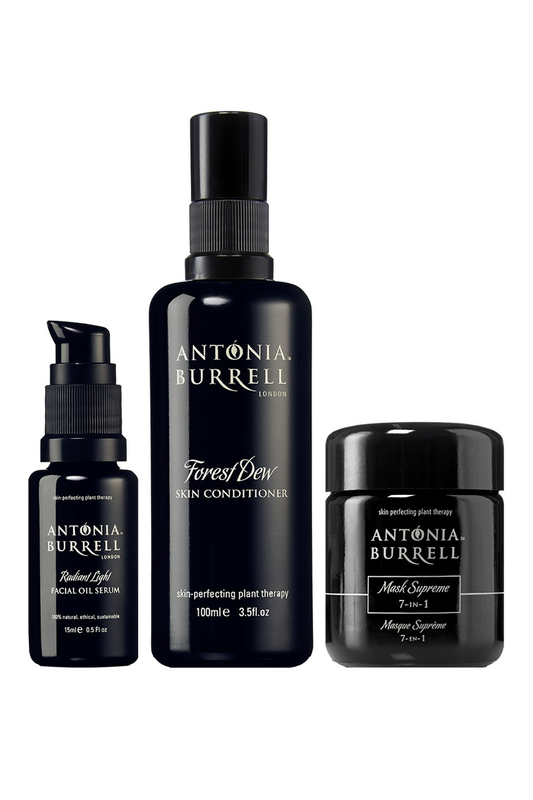 Prepares your skin to receive amazing benefits from Antonia Burrell Facial Serums and Cream Supreme Moisturiser. SAFFLOWER OLEOSOMES are 1-3 microns in size (a strand of hair is 300 microns by the way, just to give you some context), and are spheres of emollient plant oils combined with anti-oxidant vitamin E, surrounded by a phospholipid membrane and protein coat. This means that the Safflower Oleosomes which contain Safflower oil and 60% vitamin E are delivered into the skin in a time-release manner. A portion of the nutrients reach the skin immediately. Safflower oil maintains elasticity in the skin, improves luminosity, hydration levels, whilst delivering a calming effect on sensitised skin. The result? Moisture levels are improved and or balanced, improved hydration and nutrient retention, plus protection against skin oxidation. PHORIDIUM extract stimulates the synthesis of thioredoxin in the dermal and epidermal cells that delays senescence, also know as biological ageing, to give visibly younger, brighter skin, with increased luminosity. Clinically proven to protect cell DNA against UV light by 64%, to inhibit cell death after exposure to UV light by 72%, provides the skin with total protection against the formation of sunburn cells by 98% - the final signs of severe skin damage, leading to premature senescence of cells and skin. Evens and brightens the skin tone by 42%. ABYSINNIAN OIL - is light, non pore-blocking oil, easily absorbed into the epidermal tissue and promotes a smooth texture to the skin. Assists in an ironing out effect on deeper wrinkles and exceptionally dry skin will benefit from a significant improvement in tone and texture. BENTONITE CLAY has a sponge-like structure, which draws out and absorbs toxins through electromagnetic attraction and elevates the detoxification and deep cleansing process. It refines the skin texture, purifies, enhances cell renewal, improves capillary circulation and has a firming action. MANGO BUTTER - a wonderful anti-inflammatory plant extract, with superior anti-ageing properties. Reduces degeneration of skin cells and restores elasticity, due to a powerful anti-oxidant ability that protects from UV radiation. Dermatologists often recommend mango butter to smooth acne scarring and for the treatment of wrinkles. LACTIC ACID - An alpha hydroxyl acid (AHA), that loosens and lifts away dead cells to encourage and promote the growth of new ones without provoking irritation. Helps to restore and correct hydration levels and pH balance. Helps to lighten any discolouration or hyper-pigmentation that result from the acne. Regeneration properties helps to diminish spots and scars, clear up sudden eruptions and blemishes. Rejuvenates ageing skin by improving skin tone and restores equilibrium to dry and oily skin and it firms and reduces inflammation. It has a positive and calming effect on the mind and body and promotes mental relaxation by fighting off anxiety and stress. Emotional distress takes up a lot of energy, resulting in fatigue and Frankincense Oil helps to push energy levels back up. During a change of season skin can feel compromised so if you are suffering from dryness, flaking, sensitivity, uneven skin tone and even breakouts, this Seasonal Skin Fix collection will help! A trio of products handpicked personally by Antonia, this exclusive offer is available throughout October only. Check out the latest blog post how to get skin season-ready to read more. Top Skin Fix Tip - Mix a small amount of Mask Supreme 7-in-1 with 6 pumps of Forest Dew Skin Conditioner. Rub hands together and massage into your skin until all absorbed. Brighten & Hydrate Skin Fix Tip - Mix 1 pump of Radiant Light Facial Oil Serum with 3 pumps of Forest Dew Skin Conditioner. Massage into face and neck until all absorbed. These tips are best applied to your skin at night time. Check out the latest blog post how to get skin season-ready to read more. Apply an even layer to the face and neck. Leave for 10 minutes and remove with a hot cloth. For an added boost, leave Mask Supreme on for longer or even over night to benefit from the Oleosome technology and other fabulous plant bio actives so they can work hard for your skin as you sleep. Morning and evening or as directed. Massage 1 – 3 pumps into damp skin after cleansing with Natural Glow Cleansing Oil and Forest Dew Skin Tonic. Saturate cotton pads with Forest Dew Skin Conditioner. Wipe over face to remove all traces of Natural Glow Cleansing Oil and to balance, treat, hydrate and refresh. Purifed Water, Carthamus Tinctorius (Safflower) Oleosomes, Bentonite, Glyceryl Stearate Citrate, Cetearyl Alcohol, Glyceryl Caprylate Cetyl Esters, Tricaprylin, Propanediol, Xanthan Gum, Glycerin, Phormidium Persicinum Extract, Brassica Abyssinica (Abyssinian) Oil, Limnanthes Alba (Meadowfoam) Seed Oil, Mangifera Indica (Mango) Seed Butter, Cetyl Palmitate, Sorbitan Palmitate, Sorbitan Olivate, Carapa Guaianensis, Euterpe Oleracea, Copaifera Officinalis, Tocopheryl Acetate, Sodium Caproyl/Lauroyl Lactyl Lactate, Triethylcitrate, Salicylic Acid, Sorbic Acid, Benzyl Alcohol, Pelargonium Roseum Asperum (Bourbon Geranium) Flower Oil, Boswellia Carteri (Frankinsence) Oil, Citrus Medica Limonum (Lemon) Oil, Lavendula Augustifolia (Lavender) Flower Oil, Eucalyptus Globulous (Eucalyptus) Leaf Oil, Lactic Acid, Sodium Phytate, Limonene, Linalool, Geraniol.